So it's ironic that one of the most important activities I have done in my classroom in the past month since returning from Christmas break involves math. rate exercise, I was amazed at how empowering it was for them to know how much (or little) stamina they had for reading. Students who had a lot of stamina were surprised and delighted, saying things like, "I didn't realize I could read that much," or, "I can't believe I can read almost a whole book in two hours!" Students who had little stamina often said something along the lines of, "I'm disappointed with this number but I want to work to make it higher." I was not expecting this to be such a motivating tool for students, but lo and behold, it was. But in addition to being motivating, it has the added benefit of helping students realize what they are capable of despite what they think to be true. On Friday I assigned literature circle books to all of my 6th graders. They spent the entire first half of the year choosing their own books and exploring their reading preferences so now it was time for them to put their new stamina to work and see how they do with a book that someone assigns to them. The first thing I had them do on Friday was to read their newly assigned book for ten minutes to see what their new reading rate was. Once they knew their reading rate for that book, I had them meet with their groups to decide what pages they should be finished with for each of their three discussion meetings. As I was walking around the room, observing and listening to students working together to decide on page numbers, I noticed one particular group was getting a bit heated about what page they should read to for their first meeting. 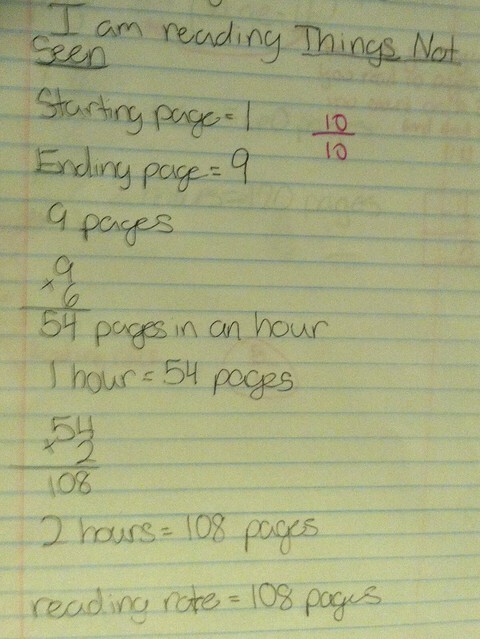 One student in particular thought reading 70 pages in one week was too much, and when I asked her what her reading rate was, she told me 108 pages. When I pointed out to her that if she can read 108 pages in 2 hours, then she can read 70 pages in a week, there was no more argument. The group settled on 70 pages and that was the end of that. So I guess if I have to do any sort of math in my classroom, I'm glad it's the kind of math that helps my students see what is possible in their own reading lives, especially when they don't realize just how much they are truly capable of.